YOUR SAFETY IS OUR FIRST CONCERN!!! Save travel time. Complete your Driver Education at home or any place with internet access. With our specially designed online course it's easier than ever to get your California Drivers Permit. Log on and start learning right away. Go at your own pace start and stop as many times as you need. You study according to your schedule. After you complete your course, you will receive a DMV recognized Certificate of Completion of Drivers Education within 1 or 2 days. Easy and affordable payment method makes it easy to pay for the course. 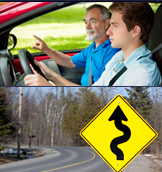 Copyright 2008-2012 © Drive Star Driving School, All Rights Reserved.